The groundbreaking study was published today in the journal Nature Chemical Biology. For years, researchers have been looking for more sustainable sources for the raw materials used to make the products we use every day. Recently, biomass made from corn or sugarcane is used in manufacturing of a wide range of non-food products from plastics to fuel. However, use of food to make inedible products is controversial because it affects the food supply and can elevate food prices. In this study, researchers looked at turning inedible biological byproducts, that scientists call lignocelluloslic biomass, to produce useful products to avoid the "food versus chemical" purposes. They specifically looked at the process to use lignocellulosic biomass to produce butanediol (BDO) that is used to produce more than 1 billion pounds of spandex each year used in clothing and home furnishings. In 2010, it was estimated that spandex was used in 80 percent of all clothing. To establish the platform pathway, researchers examined the gene sequences from bacteria and fungi that turn the biomass into tricarboxylic acid (TCA) intermediates. The researchers call this new metabolism "nonphosphorylative metabolism," which enables the production of useful products from TCA cycle with less than five steps, compared to previous 10 steps. Less steps in the process resulted in a 70 percent higher yield in production and a process that is overall better for the environment. What excited researchers the most was that this pathway could be used for more than just producing BDO for spandex. It can be used to produce a variety of useful products. 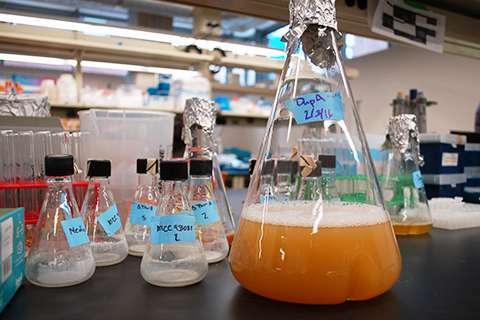 "We found that this new platform could be used to convert agricultural waste to chemicals that can be used for many other products ranging from chicken feed to flavor enhancers in food," said the study's lead researcher Kechun Zhang, a chemical engineering and materials science assistant professor in the University of Minnesota's College of Science and Engineering. "The pathway we developed was sustainable so it is better for the environment. This study is also one of the few examples of artificial metabolic pathways constructed so far," Zhang added. Bacteria and fungi that turn the biomass into tricarboxylic acid (TCA) intermediates. I know this is different from what happen if you open a bottle of wine and let air mix with the wine. It becomes acidic or vinegar after a while.